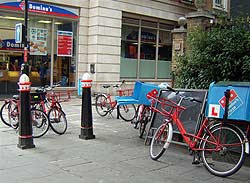 The branch of Dominos pizza in Queen St, in the City, does a lot of its deliveries by bike. (Delivery policies are not set centrally by the company, but locally by franchise holders.) We saw six of them stacked up the other day. Can we have a "narrow lanes" pizza - pizzas with a thin crust that resemble narrow cycle lanes, stuffed with loose chippings and other detritus? Lol, I think pizza delivery should always be done on bikes- that's great! They look like ex-Royal Mail postbikes - nice to see them going to good use.